With this paper, their contribution is two-fold. 1. they presented how the single-neuron building block of a SNN can be realized with nanoscale phase-change devices in an all-memristive configuration. 2. this computational primitive was incorporated into a neuromorphic architecture enhanced with the biologically-inspired scheme of level-tuning neurons. 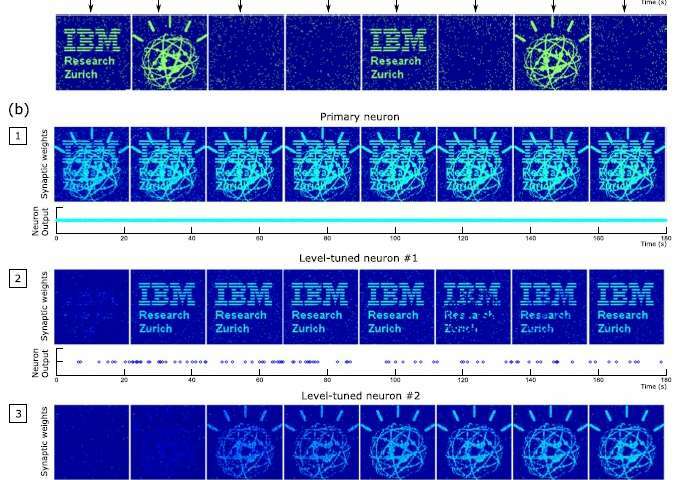 Theydemonstrated experimentally that the proposed all-memristive neuromorphic architecture is capable of learning multiple correlations from a large number of input streams in an unsupervised manner. Inherent characteristics of phase-change memristors, such as multilevel storage, accumulation, and state-dependent dynamics, render them a promising technology for all-memristive neuro-synaptic implementations. Combining the above with their proven characteristics of high speed, low energy and excellent scalability developed in emerging memory applications, an all-memristive computational primitive offers all the key features for application in large-scale neuromorphic systems. The experimental studies presented in this work demonstrate that despite the simplified neuro-synaptic implementation and the inherent variability of the phase-change cells, the memristive components provide the required neuromorphic functionality. However, open issues related to the interconnectivity and the integration of the memristive components in a neuromorphic processor chip, remain to be addressed. Further work should also discuss the algorithmic implications of the variability, stochasticity and storage resolution of the memristive neurons and synapses in more complex neural network configurations. In biology, architectures with highly variable components can adapt and perform specialized operations in a robust way. Key features of biological systems are the best source of inspiration for building compact and efficient artificial neural systems for computing applications, such as big data analytics and sensory information processing. In this paper, inspired by specialized coders of low-sound levels in the auditory cortex, they incorporated the level-tuned neuron approach for detecting multiple correlated input patterns. To implement level-tuned neurons, state information already present in the neuronal structure was exploited. This information provided powerful insights into the characteristics of the input data streams, which proved instrumental for the experimental demonstration of multiple pattern detection. Therefore, they believe that this development could function as the basis for further research in enhanced large-scale neural network configurations. In the new era of cognitive computing, systems will be able to learn and interact with the environment in ways that will drastically enhance the capabilities of current processors, especially in extracting knowledge from vast amount of data obtained from many sources. Brain-inspired neuromorphic computing systems increasingly attract research interest as an alternative to the classical von Neumann processor architecture, mainly because of the coexistence of memory and processing units. In these systems, the basic components are neurons interconnected by synapses. The neurons, based on their nonlinear dynamics, generate spikes that provide the main communication mechanism. The computational tasks are distributed across the neural network, where synapses implement both the memory and the computational units, by means of learning mechanisms such as spike-timing-dependent plasticity. In this work, we present an all-memristive neuromorphic architecture comprising neurons and synapses realized by using the physical properties and state dynamics of phase-change memristors. 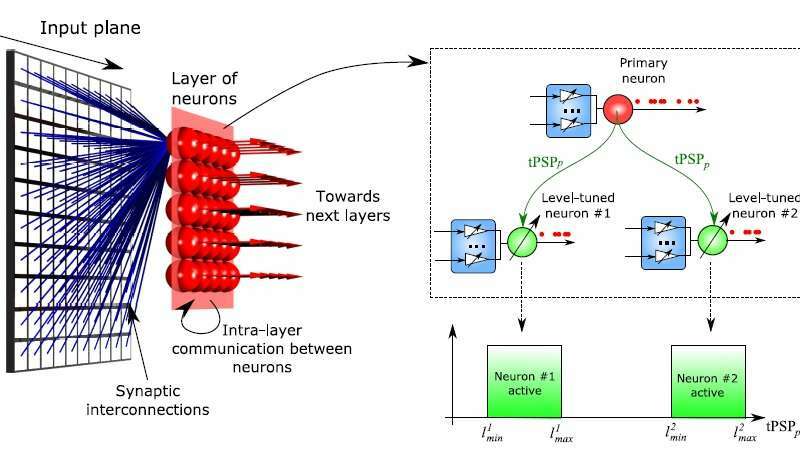 The architecture employs a novel concept of interconnecting the neurons in the same layer, resulting in level-tuned neuronal characteristics that preferentially process input information. We demonstrate the proposed architecture in the tasks of unsupervised learning and detection of multiple temporal correlations in parallel input streams. The efficiency of the neuromorphic architecture along with the homogenous neuro-synaptic dynamics implemented with nanoscale phase-change memristors represent a significant step towards the development of ultrahigh-density neuromorphic co-processors.